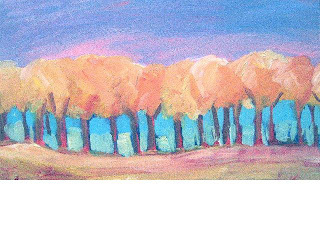 Finished the row of trees paintings. I love what happened with them in terms of color, shapes and lines. 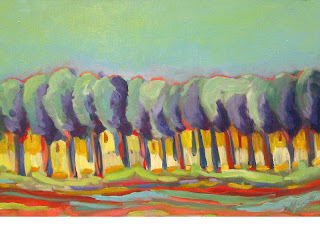 I started a new painting today and was able to transfer the same characteristics to the new painting. What a funny weather day. We had lots and lots and lots of rain along with strong thunder and lightening this morning. Which then left us with a MUGGY day. 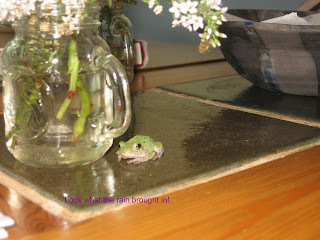 A tree frog made it into the kitchen (probably with a bushel of the never ending green beans). Much to Bob's surprise when he was pouring his first cup of coffee this morning and it jumped on his leg and suction cupped itself to him. So Bob caught it to put it outside, but it got away. I found it this afternoon hanging out on the kitchen table.